From the traditional Spanish villages with the cobblestoned streets to the white-washed cottages, from the luxury yacht to the spectacular coastlines and sandy beaches; Spain has much more for the soon-to-be-wedded couples! The warm Spanish hospitality, the exotic locations, a full menu of delicious foods, awesome climate, and the long list of refreshing wines altogether can make your wedding day truly memorable day. 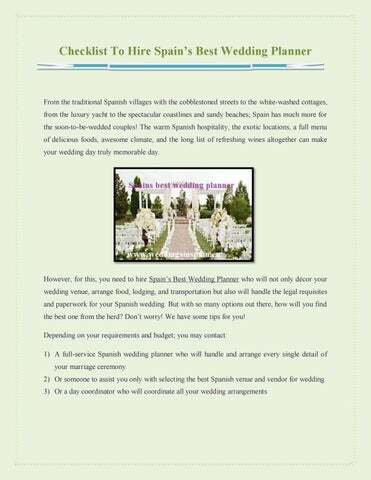 Spanish Wedding Planner Checklist  Go by the wedding planner’s experience  Check skills and past works  Discuss your wedding visions openly  Know what wedding themes he/she has for Spanish locations  Talk over the tariff openly  Ask for packaged deals If you’re looking for Spain’s Best Wedding Planner; look no further than Costa Blanca Events! 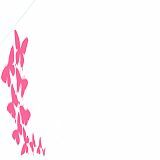 For more details; visit us at URL: http://www.weddingsinspain.eu!